Venezuela’s National Telecommunications Commission (CONATEL), which regulates electronic media, has blocked access in the country to Colombia's Colombian television station Caracol. Venezuelan officials have blocked access to Colombian television station Caracol and threatened a clampdown on social media networks in Venezuela, continuing the government’s efforts to exert control over the flow of information. Caracol’s management confirmed the block Thursday via Twitter, noting that President Nicolás Maduro had “launched harsh criticism of Colombian media" hours before ordering the move. Caracol joins an extensive list of foreign media forced off the air in Venezuela, including U.S.-based international cable channel CNN, that Maduro contends have tried to discredit his government. Maduro had denounced Caracol's reporting on deposed Venezuelan prosecutor Luisa Ortega Diaz, who, fearing for her life, fled last week to Colombia with her husband. Ortega has accused Maduro and several of his closest collaborators of corruption. Visiting Brazil this week for a meeting with other prosecutors from countries in the Mercosur trade bloc, Ortega said she would provide evidence to help them submit charges. Spokesmen for the Venezuelan government rejected those accusations. FILE - Delcy Rodriguez appears just after being sworn in as president of Venezuela's Constituent Assembly in August. Earlier this week, the leader of Venezuela’s new pro-government Constituent Assembly – which on Friday wrested power from the opposition-led legislature – threatened a clampdown on social media networks. Delcy Rodriguez, president of the government's most powerful body and part of Maduro's inner circle, said proposed anti-hate crime legislation could regulate and punish incendiary speech on social media. Speaking during an assembly session Tuesday, she said Venezuelans were "victims of psychological war" conducted by "imperialist" propagandists. Given media censorship in their country, Venezuelans frequently use social networks to stay informed, according to Venezuela’s Institute for Press and Society. Social media posts by Maduro's political opponents also helped bring out demonstrators during often-violent anti-government street protests that began in early April. 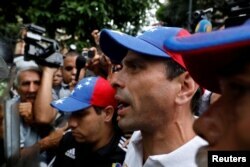 Henrique Capriles, an opposition leader and Miranda state governor, responded to the possible clampdown by challenging Venezuela’s National Telecommunications Commission (CONATEL), which regulates electronic media, to act against state-run Venezolana Televisión (VTV). "If they are going to prohibit someone from promoting hatred in the country, well, all the government spokesmen will be silent," said Capriles, who has his own YouTube channel. FILE - Venezuela opposition leader Henrique Capriles confronts security forces at an anti-government rally in Caracas, Venezuela, May 12, 2017. CONATEL has "pressured many TV and radio stations" to avoid coverage that cast the Maduro administration in a bad light, the U.S.-based advocacy group Reporters Without Borders observed in a report updated this month. RWB said "persecution of journalists and censorship of the media … is intensifying dramatically throughout Venezuela." The U.S.-based watchdog group Freedom House says press freedom in Venezuela already had declined precipitously under socialist Hugo Chávez, president from 1999 until his death in 2013. The administration of his successor, Maduro, "has increased government interference in private media and continued developing a communications apparatus that is meant to act as a state mouthpiece," Freedom House reported on its website. "Media organizations and workers face intimidation, threats, and violence by both state and nonstate actors." Venezuelan authorities ordered the CNN signal in Spanish to be removed from local cable operators' programming grid in February, shortly after it reported on the alleged use of fake Venezuelan passports. At the time, Maduro called CNN "an instrument of war" that was promoting aggression against Venezuela.